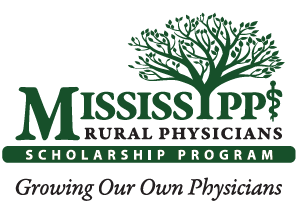 We were instrumental in creating the Mississippi Rural Physicians Scholarship Program (MRPSP), which was passed in the state legislature in 2007. MRPSP is a unique longitudinal enrichment program that identifies rural students who aspire to return to their roots to practice medicine. A solid academic and public service record, strong work ethic and desire to practice rural medicine in Mississippi are the basic requirements. By starting at the undergraduate level recruiting and mentoring students from across the state who are primarily from rural areas, MRPSP allows Mississippi to ‘grow our own’ rural primary care physicians. Since inception, the Mississippi State Legislature has allocated $12.6 million in scholarships, and private funding has also contributed to the funding. Increased funding over the years has increased the number of students able to participate, in turn increasing the program’s impact. The program also has an economic impact on Mississippi. The addition of one physician to a community contributes an average of $2 million in additional economic output and an average of 21 jobs. Therefore, in addition to improving healthcare in the areas of Mississippi that need it the most, these primary care physicians reportedly have an economic impact of almost $50 million on our state.